If you are looking to hire an entertainer with a difference for an office party in Liverpool Chester Wirral Northwales then look no further. 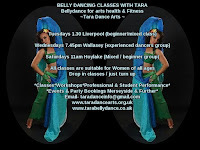 Tara offers a mini dance show also known as a dancing Bellygram. A dancing Bellygram is a short and sweet belly dance show that is similar to a singing telegram only in the form of an entertaining belly dancer who does not sing. Wether it is a leaving do, A suprise birthday party or even a Christmas party a dancing Bellygram is most definitely suitable for this type of occasion. Tara turns up in costume (covered) with her mobile speaker all ready to get the party started. This type of booking is great for day time parties and fits in perfectly in lunch hour. This is a great opportunity to create some lovely and comical memories not to forget the photographs. Hire office party Entertainment Merseyside.